Jason Elliott had been chief of staff to San Francisco Mayor Ed Lee for only about six months when he got the call last December that Lee was in the hospital. Within hours, Lee died -- and Elliot had to step up to help keep the city running. Over the coming months, he would advise two different mayors as the city went through a truncated and highly contentious special election to replace Lee. 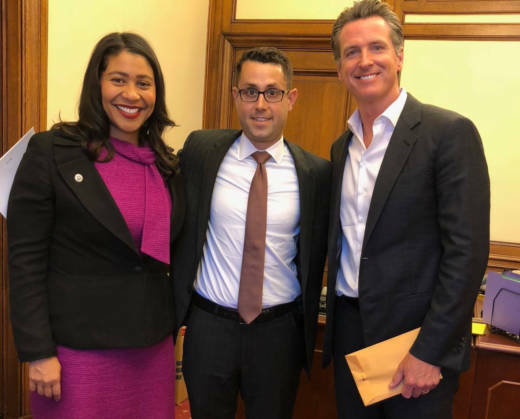 Now, a little over a month into Mayor London Breed’s term, Elliott is leaving City Hall to work for Lt. Gov. Gavin Newsom’s gubernatorial campaign. Elliott sat down for an exit interview with KQED politics reporter Marisa Lagos. Marisa Lagos: You step into these huge shoes, and then about six months later Mayor Ed Lee suddenly dies in the middle of the night. And he was a friend and a mentor, so it must have been an incredibly difficult thing emotionally. But you also had to immediately get to work. Jason Elliott: So for me, nobody takes a job of chief of staff thinking you’re going to be the one who has to call the president of the Board of Supervisors at 1 in the morning. It’s just not something you ever want to do. And it’s not something you ever picture doing. You know, we practice the earthquake. We practice for terrorism. We practice with legislation. But you don’t practice for that. And it was one of the hardest days and some of the hardest weeks of my life, and I hope will be the hardest weeks of my life. And making sure as the city was grieving, as we personally were grieving, that people getting up the next morning could go and get on Muni, and if they called 911 that the police would show up, and if they wanted to go to the park, that the park would be open. So there’s something about continuity that underpinned how we moved forward through those next few days. Lagos: London Breed became acting mayor, but she was only in that position for a couple of months before the Board of Supervisors controversially replaced her with interim Mayor Mark Farrell, and then of course London Breed got elected. So, in the course of just a few months you had three different mayors that you served as chief of staff. What was the most difficult thing about navigating that? Was it the personality differences? The policy differences? Elliott: I think the most challenging part was trying to take the mayor’s staff and key department heads and insulate them from the political turmoil that was happening inside City Hall and around the city. We couldn’t control the outcome of the mayoral election, and my advice to staff and department heads was: Don’t try to do that. Do the best you can -- what Ed Lee would want us to do is to run the city as professionally as we possibly can. Lagos: So you spent the last couple months helping London Breed’s administration get settled. Tell me about that transition and sort of what your role has been. What have you been trying to pass on to the people who are now going to come after you? Elliott: The job of a chief of staff is to implement the vision of the mayor that he or she works for. And that can mean big vision things, and it also means the day-to-day of running a city. The mayor of San Francisco cannot possibly be involved in every decision that gets made across our 60 departments, from the airport to the zoo. So, I’m gonna miss the troubleshooting with departments and mayor staff. My favorite part of the job is when we get together in a room and there’s just this unsolvable, complicated problem, and you get to just dive into it and unpack it piece by piece and try to help solve the unsolvable.